You can now download Ian Irvine's Vengeance for only 2.99$ here. 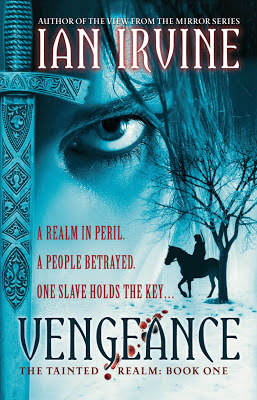 VENGEANCE is the first book in the Tainted Realm, a new fantasy series by much admired author Ian Irvine. It's a story of betrayal, murder and a girl's hunt for justice in a world where two peoples are divided and mistrust can only lead to war. In Cython’s underground slave camps, only the timid and obedient survive – but Tali is neither of these. In Cython, having magic means the death penalty, and Tali’s gift is swelling out of her control. Though no slave has ever escaped, Tali must, for she has sworn to bring her mother’s killers to justice. She meets Rix, a nobleman, and together they flee through a land at war, pursued by enemies and allies alike. Before they can solve the crime, and save the realm, they must learn to trust each other. Rix’s subconscious is scarred by a sickening secret that he comes to realise links him to the killing. Tali is hunted by a faceless enemy that can only be beaten by magic. The one person who can teach her how to use her unique and unruly magic is the killer himself.